Most businesses need to borrow money at some time or another. Traditionally, a local bank is the first call an entrepreneur makes for funding. Once you click through the internet teaser rates – and the associated small print – and get to a human, the optimistic businessperson quickly learns borrowing from a lender comes with a spaghetti soup of strings and fees. For the well-capitalized borrower, there is a different way. Securities-based lending is frequently associated with borrowing “on margin” using investments as securities to buy more of the same type of investments. For example, you own 100 shares of Starbucks and want to own more. So, the brokerage firm where you hold your Starbucks shares extends you credit – using your already purchased shares as collateral. Then, depending on how much you would like to borrow, subject to “House” limits, you may purchase more Starbucks shares. Your future fortunes depend on market action in Starbucks stock. If share prices fall, you may be forced to sell or deposit more money to maintain enough equity in your account. Conversely, if the price rises, you enjoy a magnified rate of return than you otherwise would have earned – thus the term “leverage”. I do not recommend ever doing this type of investing. For most business owners, having money in the “chaotic” stock market is vitriol! Instead, they would rather have their money invested in “what they know”. Certainly understandable; however, "what they know" typically requires more capital than they have on-hand, thus the rather large commercial lending industry. This industry is not limited to banks – private equity, insurance companies, and a whole host of other entities looking to earn a return on their cash proliferate the space. Let’s further assume the Resilient Widget Company will use the $100,000 in Capital to build the next great Widget making machine. This machine, prospectively, will take Resilient’s accounting profit from $70,000 to $80,000 and its cash flow from $90,000 to $100,000, with a proportionate increase in top-line sales. If Resilient Widget Company were to go to a bank, the terms would likely be 80% financing ($80,000), Amortized over 7 years at 6%, with a balloon payment in 3 years. This results in a monthly payment of $1,169. The first year’s total interest payments, which is tax deductible, would be $4,542. At the end of three years, the loan balance of about $50,000 would be refinanced at prevailing terms. Additionally, the borrower would have to pay origination fees, legal fees, appraisal fees, and provide a corporate and personal guarantee of the loans to the bank in addition to meeting loan covenants (Fixed-Cost Coverage Ratio [FCCR] in industry parlance)…there is little you can do to hide as a borrower these days. What I just described is what I would call the “conventional way”. Open an account on-line at Interactive Brokers. Deposit $102,000 of cash in the account. Withdraw the $100,000 needed for the Widget Machine. Current (June 14, 2018) Margin Lending Rates at Interactive Brokers are 3.25% for $100,000. Purchase the Widget Machine and execute the business plan to grow the Resilient Widget Company. 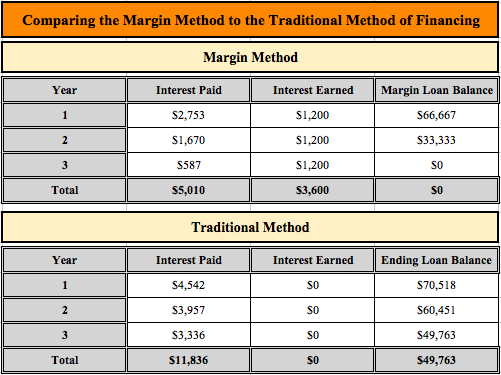 Monthly, the Margin Loan would “reconcile” and interest due would increase the Margin Loan. Using simple math – the real numbers would differ slightly – the interest due would be $100,000 * .0325 / 12 = $270.83. Assuming the business would want to extinguish this debt in a timely manner – say 3 years – the increased earnings ($10,000 in this case) would be used to deposit funds into the brokerage account monthly just as would have been done with the traditional bank loan. 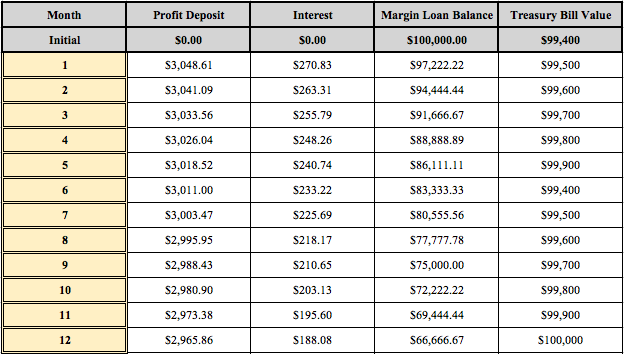 Each deposit would serve to pay the accrued interest and also decrease the margin loan balance. All the while, the 6-month Treasury Bill would inch higher in value towards $100,000. As you can see, the interest payment would decrease each month as the Margin Loan balance decreases. Also, the Treasury Bill would mature in month 6 and would be replaced by a new investment. From the chart above, you can see the Margin Method has the borrower paying significantly less in interest than with traditional lending. Specifically in Year 1, the net borrowing cost of the Margin Method, where the margin interest is offset by the investment income, is “only” $1,553 on $100,000 of capital – or 1.553%. This effective rate is about 4.5 percentage points better than a traditional lender in this example. Obviously, individual results may vary significantly dependent upon the terms available for either lending strategy at the time. This example has been simplified to better illustrate a specific point – I readily admit there are a myriad of other considerations when evaluating financing options. However, I can say from several years of first-hand experience that the Interactive Brokers margin lending rates are the lowest I've seen. Moreover, the Interactive margin rates have been lower than the lending rates I have seen from traditional lenders. For specific situations, obviously, a more detailed analysis must be made before any recommendations can be proffered. If your business is well-capitalized and you have a great deal of cash on your balance sheet with capital intensive requirements in the offing, Securities-Based Margin Lending may be a good fit for you. For those business owners who are finding it difficult to secure financing due to short corporate credit history, a misunderstanding or under-appreciation of your business plan, etc., AND you have a surplus of funds available, Securities-Based Margin Lending may make sense for you. This reasoning would apply to wealthy people looking to start their own business as a second act. 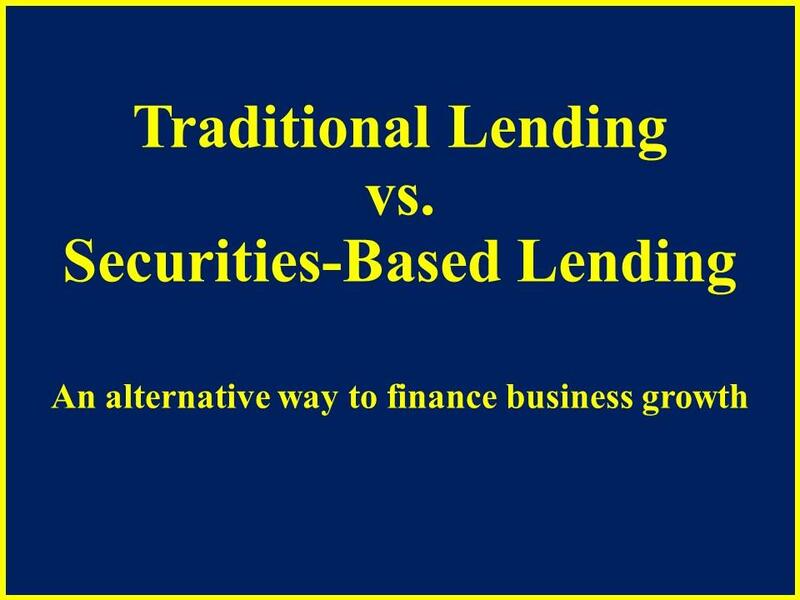 If you are unwilling to provide corporate or personal guarantees to a lender for one reason or another, then Securities-Based Margin Lending may make sense for you. If you dislike the loan underwriting process and the associated costs and time delays, then Securities-Based Margin Lending may make sense for you...the process I described can usually be done in about a week or so. If your business is presently over-leveraged with little to no cash on your balance sheet, Securities-Based Margin Lending is likely not going to work well for you. For those skeptical of Securities-Based Lending, the securities suggested with this technique are United States Treasury Bills – one of the most liquid and secure of any investment anywhere on our planet backed by the "full faith and credit of the United States Government". Indeed, Interactive Broker's Maintenance Requirement on United States Government Securities maturing in 6 months or less is only 1% of the Loan Balance. That is, $1,000 equity on $100,000 borrowed using $100,000 in 6-month Treasury Bills as collateral. For those concerned about Margin Rates moving, this is a legitimate concern. However, the effect of Margin Interest Rate movements will be tempered by a concomitant move in short-term Treasury Bill rates...they will move in tandem Thus, the interest rate spread should remain approximately the same regardless of what market interest rates do. This is decidedly not the case with traditional lenders. If for whatever reason, the purchased equipment does not deliver the expected result or there are other corporate hiccups, the company can simply cease making any payments and the expiring Treasury Bill will repay the borrowed funds. At the end of the day, a business ought to be aiming to achieve the highest return possible on its assets while assuming liabilities with the lowest cost. To be sure, successful businesses manage both sides of the balance sheet well. With Securities-Based Lending, a company can utilize its cash resources to finance any corporate need with "Other People's Money". The opportunities to utilize this technique are limited only by one’s imagination and the cash on their company's balance sheet.